Ok for once it turned out that I was unable to click more pictures in the recent dinner party. I just managed to click most of the dishes together, while rest was being prepared. This time for a change in the menu, Amma wanted to try something else, different from our usual menus. She always says she would want to have her best dish included, even if the new dish that she tries flops, which of course has never happened. Anyway it’s always better to be prepared right. So we have this Chettinad Chicken curry that Amma makes, she wanted to vary the ingredients and made a new combination. This was again liked much, so needless to say I am here to record that on dot! You must make it and enjoy as I have heard very good feedback on the Kulambu. She also wanted to make the roast, which was again a derivative of another dish. All in all this menu was assembled mostly with a thought that we create a new list with what we have already! Kids loved the Paneer Butter Masala. Did I tell you that the current Paneer Butter Masala has gone through lot of modification from what it’s on the blog? Well I hope someday I get around sharing the recipe as well. Until then you get to just hear me talk about it all the time. With today being Women’s Day, I went out with my colleagues for an outing, leaving the guys very jealous, they were hoping they would get to go out and enjoy on Men’s day. The feminist in me shouted out “as if they don’t have a men’s day daily!”..:) On the other hand, knowing that the men in my life don’t always expect me to hen around them, I can say they can have a special day, else no chance! Dry roast the spices for the masala and grind to a smooth paste. Keep aside. Then in a pressure pan, heat oil, saute the onions till they turn nice brown colour. Add the ginger garlic paste and saute well. Next goes the chicken and you cook on high flame for the chicken to get nicely roasted, making sure the raw smell leaves. Then add the tomato puree, red chili powder, salt, turmeric powder and simmer for 5 – 7 mins. You can add the ground masala and continue cooking for another 5 mins. When you feel the chicken is nicely coated with the masala, add a cup of water and cover with lid. Cook for 1 or 2 whistle depending on the chicken getting cooked. Once the pressure falls off, add coriander leaves and cook on simmer again for couple of minutes. Since the chicken gets nicely roasted through the process, you can simply put for one whistle. Else you can check and cook for another whistle. Since you are serving as side dish for parotta, make sure pieces don’t get smashed. Makes me hungry even after having my dinner, droolworth spread. 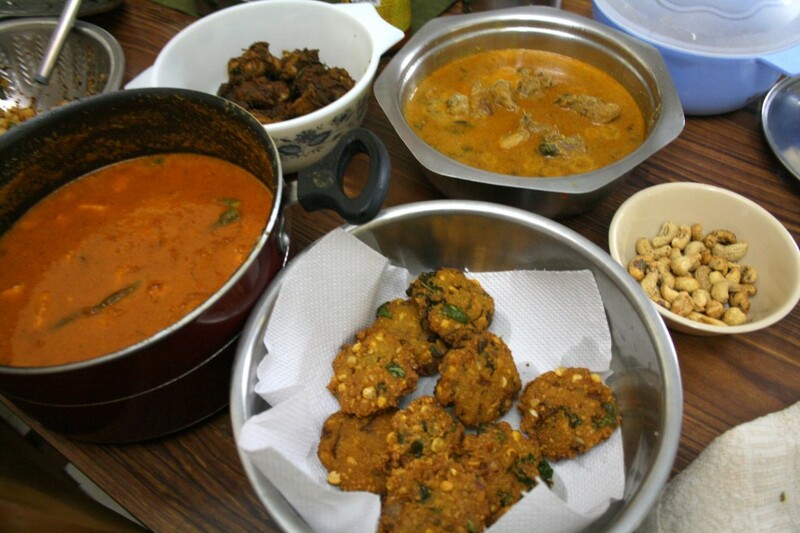 Delicious looking chicken curry, and i love those vadas too which i see on the plate.